Bullying has been a big issue in our society since the beginning of time. Today, most countries enacted laws against bullying, to protect the citizens and to also help the victims to recover and overcome their fears from the past experiences. A screenshot from the GIF. Meanwhile, on the brighter side of the topic, we will check out some so-called bullying on the Animal Kingdom. Most of us thought that the bigger and stronger ones are the bad ones. But as we can see from these animated GIFs, it's the other way around. Here are the Top 10 animation that gone viral on Social Media and brought laughters and different reactions from the online peeps. Enjoy! A surprise attack from Birdie. Duck doesn't want Doggeh to stay. A dog who successfully disguised as one of the calves. Ducklings running towards poor Kitteh. Kitteh, don't you mess with the Master Mantis! Woah... pow! A little feline that can push away a big canine. When bored, play with your pal... no... not that part. Kitteh trying to get a free ride. 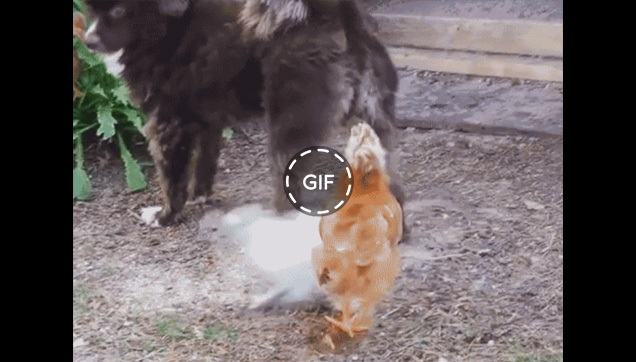 Do you have any other animated GIFs to share? Kindly share them on the comment section below.